Providing methodological and advisory assistance in the field of choreography, the exchange of experience. International Dance Festival «Baltic Pearl» will take place at the Grand Concert Hall of the hotel «Saint Petersburg» - one of concert platforms in the center of Saint Petersburg. Stage Dimensions: 14 m - wide, 13 m – deep. Floor – Ballet Floor Sheet. 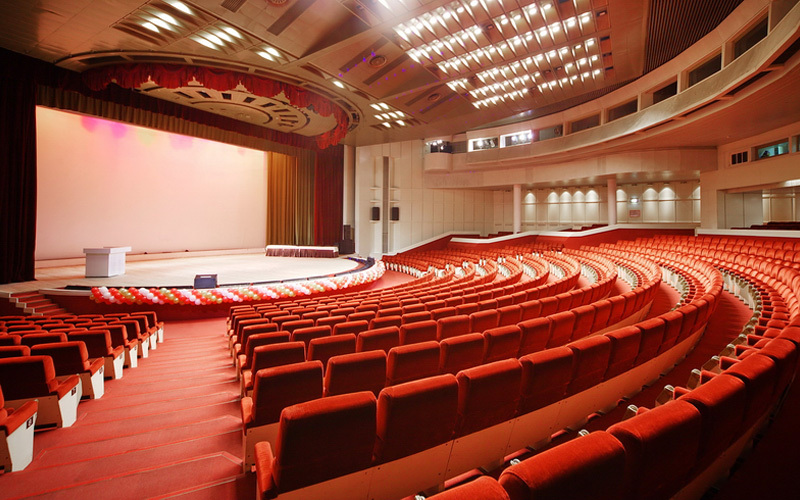 Grand Concert Hall of the hotel «Saint Petersburg» is equipped with modern sound, light and project equipment. International dance festival is open for dance groups of different styles, ballet schools, soloists and duets. One dance group can participate in a few nominations and age divisions. The total time of dance performance should not be over 25 minutes (total time for all nominations – max. 25 min). The Application Form is available in electronic form on our homepage. Deadline for sending Application Form is 10th March 2019. It is possible to correct Application Form, but no later than 24th March 2019. After that we will contact you and send the confirmation. Arrival to St. Petersburg (transfer from the airport/railway station to the hotel) Transfer to St. Petersburg on request. Free time. You can book one of our guided excursions (see «Optional tours»). Extension of the living in the hotel (on request, see extra options). The advance payment of 130 €/person should be done until 20th February 2019 through bank transfer. If the dance group has more than 15 participants, the head of group doesn’t pay the general fee. Results of the competition and awarding ceremony will be hold separately on the basis of protocol of the Juries in each nomination according to the age categories of participants and provides the awards for holder of the Grand Prix, Laureates I – III degrees and Diplomats I - III degrees. Baltic Pearl award means estimation by respected figures in the world of dance. The Juries can award some separate participants or the heads of dance groups with the following Diplomas: “Best ballet master work”, “Best concert master work”, “Best virtuosity and dramatics», the gratitude letters and precious souvenirs can be issued as well. The heads of dance groups and teachers receive state certificates of participating in workshops. All of Diplomas and state certificates will be given in English language. The Grand Prix winner will be awarded a free trip to the International Dance Festival «Baltic Palette» in December 2019 in Tallinn, Estonia. The award fund of The Festival amounts 9,000 EUR. The best dance groups will be given the incredible opportunity to dance on the one stage with famous ballet dancers of 21th century. Oleg Vinogradov (Saint Petersburg) – World renown choreographer, Professor of choreographic art. He was artistic director and chief choreographer at the Mikhailovsky Theatre (Saint Petersburg); directed such Russian ballet legends as Mikhail Baryshnikov, Natalia Makarova and Rudolph Nureyev. Valeriy Butirkin (Moscow) – Professor of Ippolitov-Ivanov Moscow State Musical Pedagogical Institute, well-known choreographer, ballet-master, State honored in the art. Ravil Bagautdinov (Rostov-on-Don) – Artistic director of the ballet school in Japan. Ballet-master of the Rostov State Musical Theater. Teacher at the Vaganova Academy of Russian Ballet. Earlier Soloist of the Mariinsky Theatre. Dmitriy Zaleski (Belarus, Minsk) – Choreographer of modern and contemporary dance, artistic director of TV Project «Everybody dance» (First Channel Russia). Owner and Artistic director of the theatre of modern choreography «D.O.Z.SK.I». With the support of: The International Dance Council (CID UNESCO), Committee of Youth Policy and interaction with public organizations of Saint Petersburg and the city administration, Oleg Vinogradov Foundation for the preservation and development of Classical Ballet, The cultural center «Salme» in Tallinn. Would you like to receive a free call back during business hours?